The Kentucky Derby, where man pushes beast to “jump” hooves through hoops, is upon us. I’m not a fan for so many reasons, but Friday is the Oaks, which is a race only for fillies and spectators are encouraged to wear pink to save the ta-tas. This one’s for the girls both horse and rider because fast girls do it in pink, wearing heels, donning hats, shrouded in flowers. 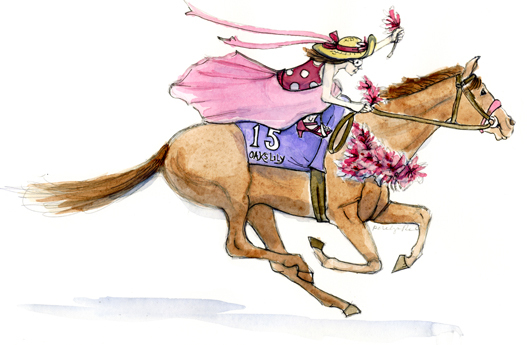 And go Oaks Lily—At 50 to 1 with silks of pink, you’re my girl! Stay safe! I love this!! My husband grew up not far from Churchill Downs, so Derby parties are a tradition with us. But I share your views on the sport itself. I say we let the horses trot around the track at a leisurely pace while we all sip juleps and eat Derby pie! Love it! I am with you on the sport…although watching horses run all out in their pastures is magical. Nicely done! I am not sure I would call that an appropriate outfit for racing, but it is terribly stylish! Love it! The shoes are fabulous! And I, too, will be hoping they all finish the race in good health – both the fillies today, & the colts tomorrow!